Which stream in Peru forms the origin of the Amazon River? 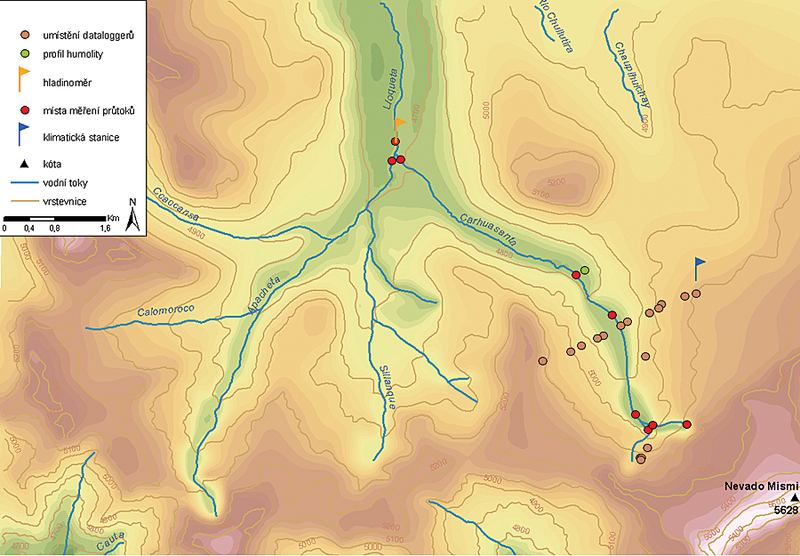 What are the latest applications of GIS in hydrology? What are the most current Esri GIS technologies? Technical talks gave attendees the latest information on Esri technology. Answers to these questions and more were provided to 850 users who attended at the 2014 Czech Republic User Conference, which was held on October 22–23, 2014, in Prague. Esri conferences offer users the opportunity to explore the latest advancements in geospatial technology, exchange ideas with peers, and learn about the many ways GIS technology is being applied today. GIS is now an important tool for researchers in an ever expanding number of disciplines. Speakers at this year’s conference discussed their use of ArcGIS in exploring areas that ranged from archaeology to voter fraud. Egyptologist Miroslav Barta talked about the ancient Egyptian empire. He discussed the influence of water on its social, economic, and religious practices and the reasons for the empire’s collapse. Political scientist Tomáš Lebeda analyzed the potential for election fraud by examining invalid ballots. Jan Danhelka and Jakub Langhammer discussed the latest applications of GIS in hydrology. Dr. Bohumír Janský of the Charles University in Prague, who has dedicated his research to finding the true headwaters of the Amazon River, detailed how GIS was used in his studies in his Keynote Address. More than 470 years have passed since Spanish explorer Francisco de Orellana returned from South America and disclosed the existence of the Amazon River to King Philip II of Spain. Because of its length and inaccessibility, speculation about the origin of the “Queen of Rivers” produced several hypotheses. The first was formulated in the 17th century by Jesuit Father Samuel Fritz, a Czech from Trutnov in Bohemia. He presented the first cartographic sketch of the Amazon River to the Viceroyalty of Peru, a Spanish colonial administrative district. This sketch showed the Lauricocha Lagoon in the Central Cordillera of the Peruvian Andes as the source of the river, a conclusion that was accepted until the 1930s. During the past 80 years, scientists and explorers, equipped with sophisticated instruments and detailed cartographic information, have determined that the source area of the Amazon lies in the mountains of Cordillera Chila in the southern Peruvian Andes. However, opinions have differed as to the exact location of its source. Dr. Bohumír Janský of the Charles University in Prague described how he used GIS in his research locating the true headwaters of the Amazon River. This map shows the catchment area of Carhuasanta, the Amazon River's main source. Janský’s plenary presentation detailed the results of his rigorous scientific work to definitively establish the location of the Amazon headwaters. For several years, he collected the most recent maps, aerial photographs, and satellite imagery of the river. He worked in the field with scientists and technicians from some of the leading research institutions in Peru including National Geographic Institute; Geological, Mining and Steel Institute; National Meteorological and Hydrological Service; National Service for Air Photography; National St. Marcos University; and National St. Augustine University in Arequipa. Supporting measurements and data were obtained using highly accurate measuring devices to ensure superior quality and precision. He concluded that the stream of Carhuasanta is the main source of the Apurímac River and subsequently the Amazon River. He also determined that the two source streams of the Amazon River emerge at the foot of the Nevado Mismi massif of the Cordillera de Chila in south Peru. His presentation reminded attendees that even today there is still the opportunity to make major discoveries through applied geographic technologies, allowing us to know our world that much better. 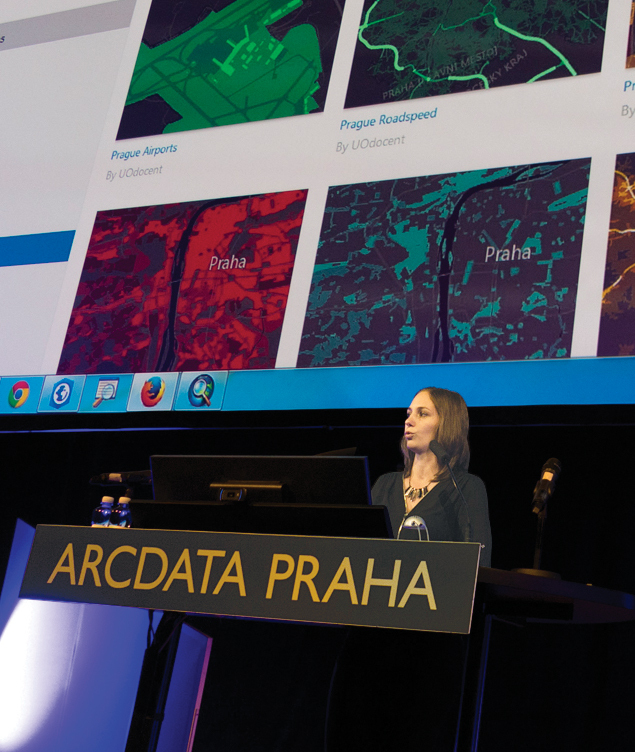 The conference also showcased Esri’s latest technology. Jim McKinney, program manager for ArcGIS software development, who discussed ArcGIS Pro, a new application for ArcGIS for Desktop, in his Keynote Address and in a widely attended workshop. User presentations showcased the use of ArcGIS in various industries including local government, utilities, facilities management, geology, natural conservation, and education. The GIS Apps showcase featured the Czech Army’s artillery application and apps by local municipalities such as a cemetery plot locator. Copies of the Atlas of the Czech Republic’s 2011 Census and the Academic Atlas of Czech History were available, and many attendees browsed through these notable cartographic publications. Three 8-by-13-foot maps produced by the Geographical Service of Czech Army, T. G. Masaryk Water Research Institute, and the capital city of Prague were also popular. The plenary talks, user presentations, and workshops assured conference attendees that geospatial technology can be applied in many ways to make the world a better, more sustainable place for ourselves and the generations to come.